When designing electric fences effectively, it is important to find the right electric fence energiser. For the wide variety of different environments and situations, we have just the right energiser. 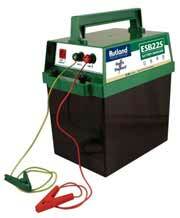 Mains electric fence energisers are the preferable choice when setting up a permanent electric fence. The benefit of using a mains powered energiser is primarily its comparatively low running costs and of course the peace ofmind that it is always on and not subject to a battery running out. Of course, with the connection to mains power it is important the energiser is in a building or suitable enclosure. Ideal for short fencing, or strip grazing, take a look at our range of dry battery powered electric fence energisers. Dry battery energisers are convenient and lightweight, allowing you to place them almost anywhere. While the dry batteries are non-rechargeable, these no fuss solutions require little, or no, maintenance. When setting up either permanent or temporary fencing where mains power is not available, wet cell battery powered electric fence energisers are the preferred option. Whether you find that the fence needs to be set up a bit more out of the way, or it is just impractical to run a cable to, one of our battery energisers coupled with a suitable leisure battery will cope very well. For more temporary and semi-permanent fencing, modern technology can provide the perfect solution. The solar powered electric fence energiser is a great choice for placing in out of the way sites. Not only easy to set up, but this lightweight energiser also provides a great, low maintenance option. The length and type of fence is also critical. For tape, rope or wire fences, for short fences or up to 40km fences the range includes the right model. With a two year guarantee, the Rutland brand stands out above all other manufacturers.